← Reminder! Tonight Is My CNBC Appearance! 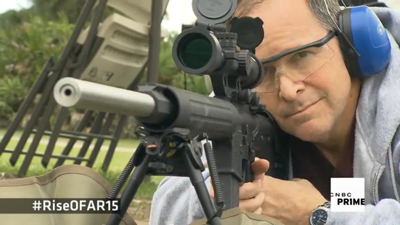 So, here’s my “post-op analysis” (for my dentoid friends) or my “AAR” ( aka “after action review” for the people of the gun) of my appearance in Thursday night’s airing of CNBC’s documentary, “America’s Gun – The Rise of the AR-15.” Overall, I was pleased. Actually, my expectations were exceeded. In my conversations with the senior producer, Wally Griffith, he assured me that his goal was to have a balanced discussion and present all sides of the “debate” including both extremes and everything in between. And, I found him to be believable. And, as it turns out, he was being truthful. Many have asked me how I got on the show. Click on CNBC comes a knockin’. I’ve been asked by many of you if I rehearsed my answers or prepared in any way. The answer is no. I didn’t get the questions in advance. And, the journalist (who is a lawyer) hammered me cross-examination-style. But, I’ve debated this subject countless times. I was ready, because I know this topic cold. I also know how to stay on point. But, I noticed something funny in the video. I wonder if you noticed it, too. Look at my body language. I was bouncing around a bit, almost like a boxer. It wasn’t a conscious thing. I just noticed it watching the video of myself. I was bobbing and weaving as the questions came at me! HA! I have to admit I enjoy the debate, and I’m glad he didn’t lob up easy questions. I will say the documentary leaned “left.” I fully expected that to happen. But, I think we “normal (pro-2nd Amendment) people” got better representation than on ANY previous broadcast on this subject. I could go on about what I didn’t like in the show. But, I am grateful to see that we DID get a “fair shake.” A small part of me wondered if I should put myself “out there” in such a public way, on national television. However… I’m not only glad I “represented”… I’m proud to have done my part. My friend, Mike, also joined us to represent law-abiding American gun owners. I wanted to express my sincere appreciation for your representation of responsible gun owners in this country with your appearance on CNBC’s special “The Rise of The AR-15”. Producers made a very wise choice in their selection and I will be writing to thank them as well. With the added scrutiny the tragedies in this country have brought on gun owners and gun legislation, it is important for those who wish to impede on our 2nd amendment right to realize that a person, such as yourself is the true face of the vast majority of law abiding gun owners in this great nation. Again, thank you for your great representation and best wishes to you and your family. You did a FANTASTIC job articulating the pro-gun owner position. The journalist summarizes what he learned. Did you watch the 1-hour documentary special? What did you think? Chime in with your comments below! 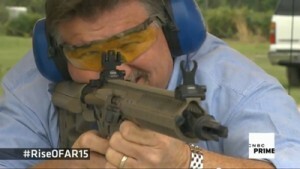 This entry was posted in Current Events, Editor's Favorites, Guns & Knives and tagged America's gun, AR-15, CNBC, guns. Bookmark the permalink. I am excited about going to the NRA convention in Houston. Over 9 acres of guns and gun accessories. Humm… I have been having record breaking production months. Maybe I need to treat myself!!!! I bet that will be fun. Some day I may go. What a sincere portrayal of responsible gun ownership rights. I like your friends synopsis “because its cool”. Great job! Good job Mike! Interesting and fair. 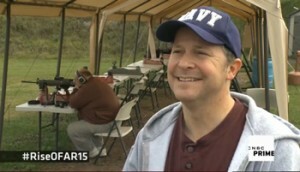 Great job Mike……..you represented law-abiding gun owners well…….